Parallels Web Presence Builder helps you create a ready-to-publish website in record time with no web design background required. It’s the fastest, easiest way for Small Businesses to create professional-looking websites. Instantly add all sorts of sophisticated features to a website without doing any coding or scripting – or having any knowledge of HTML. Web Presence Builder fits the needs of both service providers and their SMB customers, who crave a quick and affordable way to launch a web business online. It’s designed specifically for SMBs and represents a feature-rich, low cost, full professional site-building solution. LuxCloud is a leader in Cloud Service Brokerage enablement, offering a one-stop shop for white label cloud business applications. More info. Your site is optimized for mobile devices, automatically adapting to phone and tablet displays. Choose the modules that offer the preferred capabilities and drag and drop them into a site. Share information from the site on various social media, including Facebook, Twitter and LinkedIn. Templates in English, German, French, Italian, Spanish, Brazilian Portuguese, Dutch, Polish, Russian, Japanese, or Chinese. Real-time traffic stats and analytics, to keep a close eye on your data patterns and website traffic. Easily customise site layouts, colours, sidebars, backgrounds, fonts, borders and images. This Web Presence Builder user’s guide provides information about the creation and editing of websites as well as viewing statistics, comments, and new orders on the dashboard. Where can I find the manual for the Web Presence builder? 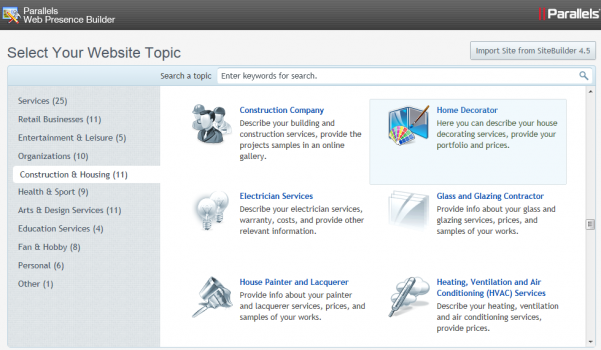 How many templates does the Web Presence Builder offer? The Presence Builder currently offers more then 100 templates to start with and unlimited possibilities to adapt them to your wishes. Is the Web Presence Builder available in multiple languages? When you select your website language, this will also affect the localization of certain website elements related to third-party components, such as Google Search. Selecting a right-to-left language also switches your website to the right-to-left mode.